What do you think, if you got a chance to watch latest Bollywood movies online for free ? Awesome! Isn’t it? It’s Possible now with Yahoo MoviePlex. 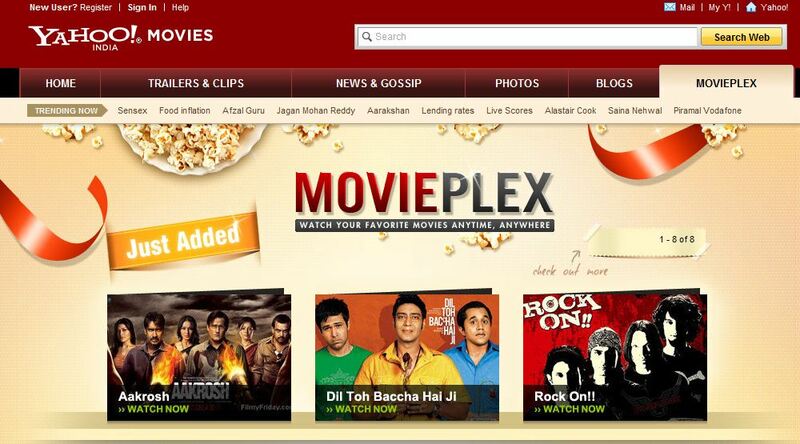 Yahoo India today announced the launch of new internet service named Yahoo MoviePlex. Yahoo MoviePlex allowing users to watch licenced full length, brand new bollywood movies for free. Yahoo MoviePlex coming in collaboration with movie production houses to bring thousands of Bollywood movies online to users for a piracy-free quality entertainment experience. I think search engine giant Google first realised that Indian internet users spending more time online for watching movies, listening to music and downloading MP3 songs. Keeping this in mind Google first launched YouTube Box Office and now Yahoo India fighting back with Yahoo MoviePlex. I’m moved to Yahoo MoviePlex page to watch one movie tonight ! Try out the brand new Yahoo service [Visit Yahoo MoviePlex Website here] for free and share your experience with us.